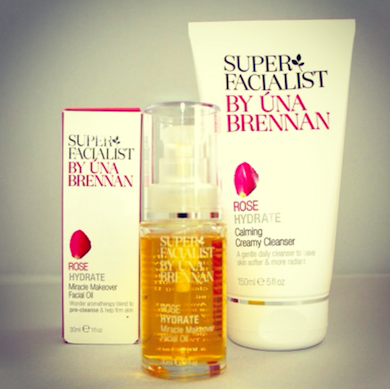 I love this double-cleanse routine from Una Brennan, super facialist. What a superb idea! It’s nothing new, of course, the idea of double-cleansing – most of you probably do it without realising. What I love about this double-cleanse is that it’s all laid out for you. Use the oil, then use the creamy cleanser. Really, I think that they should be sold as a duo, because many people wouldn’t instantly think that a “Miracle Makeover” facial oil was, in fact, a pre-cleanser. I didn’t, until I read the small print! So, you use the oil to dissolve makeup and grunge – warm a small amount between clean palms and press over the face. Massage in, even over the lid area and work into lashes to break down mascara. Then, use your flannel or cloth (wouldn’t use a Clarisonic for the oil part) and gently remove the oil. Skin should be pretty darn clean, really, but here comes the insurance: massage the creamy cleanser over the damp skin and really work it in. Again, go over the eye area and make sure that all of your pesky mascara has dissolved! Use your cloth to remove, or, if you want to use your Clarisonic, now’s the time! Bravo. Super-clean, Super-Facialist-ed (?!) skin. Nice for those with drier skin (go easy on that Clarisonic, won’t you?) but also suitable for combination. I think that there’s a separate range for oily skin, I must investigate when I pass by Boots tomorrow. A bit of oil on oily skin never did it any harm – you’re rinsing it off at any rate. If you were concerned, you could follow the oil step with your regular cleanser for oily skin. Shu Uemura also do dedicated oil cleansers for oily skin – you can find those HERE. Una Brennan’s Miracle Makeover Oil is £14.99 from Boots.com and the cleanser is £7.99 – an absolute bargain. It’s a gorgeous consistency and really gentle on dry, stressed-out skin. You can find that online here. Next Post Following the Clarins Smoky Eye Instructions!